Harry Gold was an American laboratory chemist who was convicted of being a courier for a number of Soviet spies during the Manhattan Project, including Klaus Fuchs. Gold, the son of poor Russian Jewish immigrants who came to the United States in 1914, became involved in the Communist movement early on. In 1935, Thomas Black asked Gold to aid the Soviets with formulas from the Pennsylvania Sugar Company, where Gold happened to be working as a chemist. Gold began stealing industrial formulas. In 1940, Soviet Case Officer Semyon Semenov formally recruited Gold to become a Soviet agent. Gold was assigned the codename GUS and later, GOOSE. Eventually, he would work with Klaus Fuchs on stealing American atomic secrets and sending them to the Soviets. In 1950, Gold was implicated as a courier for the Soviets by Fuchs. 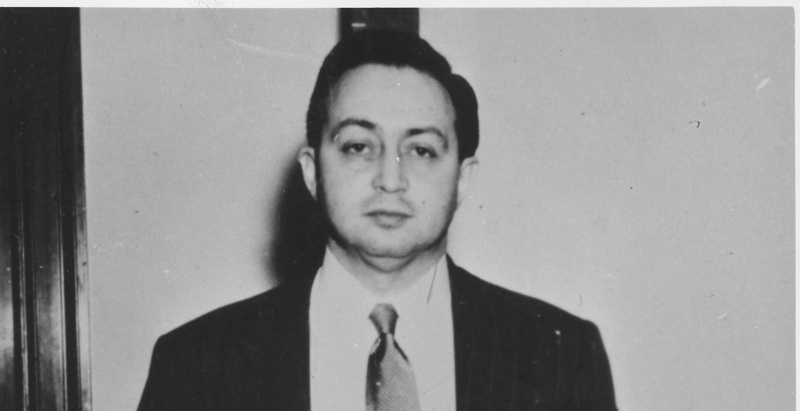 Under interrogation, Gold admitted that he had been involved in espionage since 1934 and had helped Fuchs pass information about the Manhattan Project to the Soviet Union. Gold's confession would eventually lead to the arrest of David Greenglass, another Manhattan Project employee who worked in the machine shop at Los Alamos and stole secrets about the atomic bomb. In 1951, Gold was sentenced to thirty years in prison for his espionage activities. He was paroled in May 1965, after serving just under half of his sentence. 1910 Dec 12th Born in Bern, Switzerland. 1940 Received B.A. in Chemical Engineering from Xavier University. 1940 Recruited by Soviet Case Officer Semyon Semenov to be a courier for Soviet spies.